A creative combination of radiography and techniques borrowed from meat processing and gold prospecting led to a better method for determining the lead content in ground squirrels shot by hunters to evaluate potential exposure risk to avian scavengers such as golden eagles (Aquila chrysaetos). Eleven western States produce roughly 40 percent of alfalfa in the United States, and burrowing mammals such as ground squirrels and prairie dogs can cause significant yield loss. Shooting the rodents is an important form of pest control as well as a popular recreational pastime throughout the West. 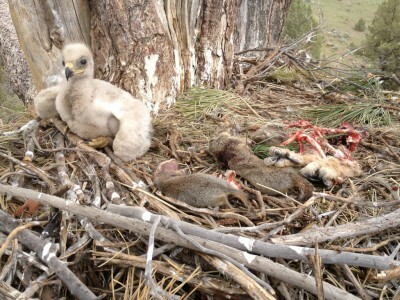 The carcasses are typically left on the field, where avian scavengers like eagles, hawks, and kestrels collect the carcasses to feed themselves and their nestlings. Exposure to lead through consumption of these carcasses may pose a threat to the health of the birds that eat them. A recent study combined two methods to determine the lead fragments present in culled Belding's ground squirrels (Spermophilus beldingi). First, radiographs were created using x-ray imaging and lead particles were digitally estimated using a software algorithm. This is the most common technique used to estimate residual lead in culled animals. The second method was a digestion procedure, which involved processing carcasses in a solution used to treat drainage systems in slaughterhouses that dissolves the tissues but does not affect the remaining lead fragments. This allowed bullet fragments to be collected using a series of sieves and a gold-prospecting sluice box. Statistical comparisons of the methods indicated that relying solely on radiography can grossly underestimate the bullet fragments present in carcasses. A dietary exposure model based on these findings and average, literature-based estimates of shot ground squirrel consumption predicted no reduction in nestling survival, but indicated the potential for sublethal effects like reduced growth, anemia, and impaired immune response. These findings have important management implications, particularly for those trying to understand the risk posed by lead exposure to avian scavengers. This study was supported by the U.S. Geological Survey (USGS) Contaminant Biology Program and Wildlife: Terrestrial and Endangered Resources Program and the U.S. Fish and Wildlife Service. Herring, G., Eagles-Smith, C.A., and Wagner, M.T., 2016, Ground squirrel shooting and potential lead exposure in breeding avian scavengers: PLoS ONE, v. 11, no. 12, e0167926, doi:10.1371/journal.pone.0167926.